A few days ago I made a batch of profiteroles and éclairs, with a minor twist: For half the profiteroles, instead of chantilly cream I used a whipped ganache made from about 2 parts dark or bittersweet chocolate to 1 part each butter and whipping cream, then whipped it to a medium-brown consistency for piping into the cream puffs. Needless to say, these ones turned out to be everybody's favourite and disappeared within seconds. Then I got asked if I could make a non-dairy version, for various dietary reasons which I won't get into here. At first I laughed, but after some further thought, it seems like it might be possible. 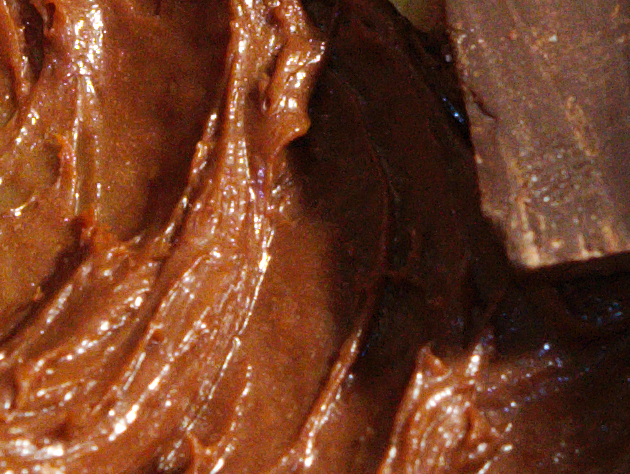 The choux paste uses only shortening for fat, so it would just be a matter of imitating the chocolate ganache. 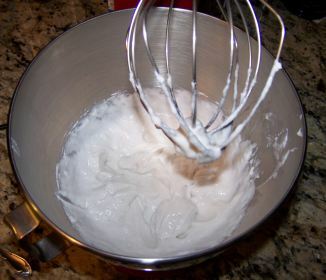 Does coconut cream actually whip, or would I have better luck whipping coconut milk? 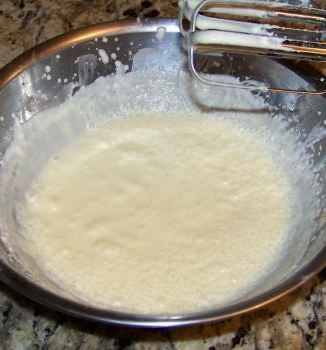 Given that cartons of whipping cream are already loaded up with carrageenan, and the recipe linked above suggests the incorporation of starch - will I need to add emulsifiers/stabilizers? Any ideas as to which ones would work best for this and in what quantity? * I don't need it to be stable for days, but it should keep for at least a few hours at room or refrigerator temperature. 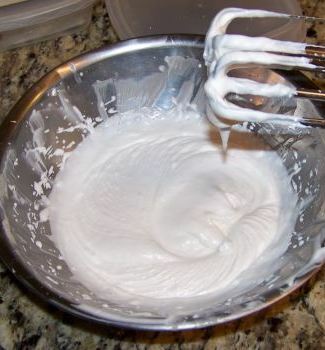 Are there relative perceived differences in sweetness between coconut cream and whipping cream? Will I need to incorporate sugar to make up for the mild natural sweetness of whipping cream, or, alternatively, is the coconut milk/cream going to be too sweet? 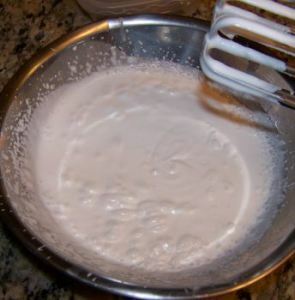 If I do need to incorporate sugar, would it make any sense to use icing sugar to act as a (partial) stabilizer, or should I stick to superfine and handle the stabilization aspect with dedicated additives? Can I rely on the coconut cream (or milk) whipping with the chocolate, or would I get better (airier/stabler) results whipping it separately (perhaps using an iSi?) and then folding it into melted chocolate (presumably adulterated with some water or butter substitute to prevent seizing)? Or could I get even better results by doing both - whipping it separately, then blending and whipping the entire mixture again to full volume? Finally, I am pretty sure that I can substitute cocoa butter for the regular (dairy) butter, but is there any reason why this part of the substitution would cause problems? * My instinct says lecithin and xanthan gum, but that's only because I know it works for a dairy chocolate/cream whip, I have no idea about coconut. Abstract: Ganache is delicious, but not everyone eats dairy. 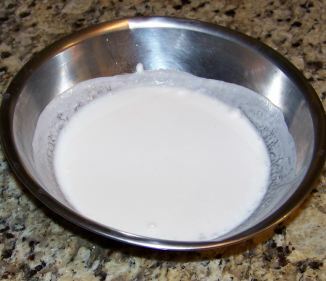 We examined whether coconut milk can be used for the creation of a non-dairy ganache. We ran a series of experiments. The answer is that, with some creative techniques, you can use it, but it does not come anywhere near to the real thing. Introduction. Someone wrote a question on Seasoned advice about coconut based ganache and we got curious. Background. We love ganache even more than pure chocolate, and make it often ourselves, so we think we have all the prerequisites needed to create and judge a coconut based ganache recipe. 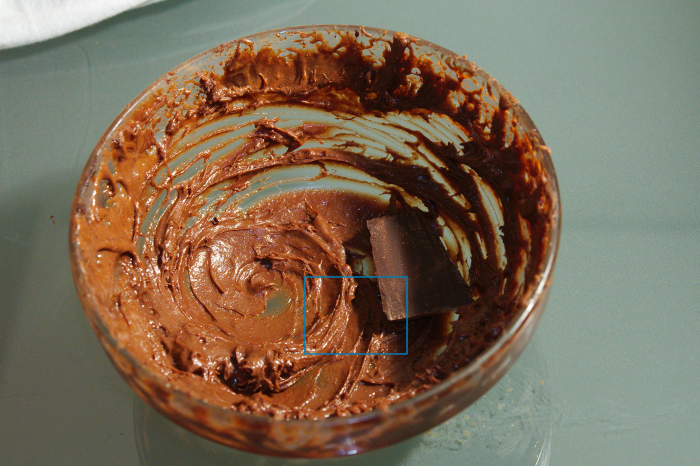 Our favorite ganache recipe 1 (which we used as a starting point) is: 100 g chocolate, 72% cocoa (only made from cocoa, sugar, and cocoa butter, no vegetable fat or emulsifiers); 100 g cream, at least 30% (non-UHT), 25 g butter. Method. 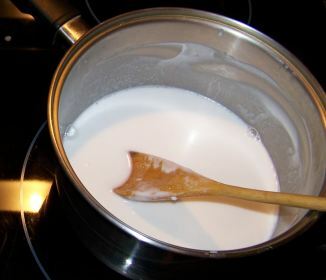 We prepared the base mix as follows: 25 g coconut milk were heated until boiling. They were removed from the heat. 25 g chocolate (72%) and 6g cocoa butter were added. Everything was left to dissolve. 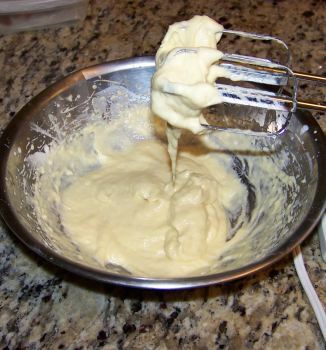 After 5 minutes, the mixture was whipped with a handheld mixer at the second-to-highest setting. This was Version 0. It was divided in two batches. Different versions were made from each batch by gradually adding guar (a knife-point-ful), egg yolk (1, in lieu of lecithine) and sugar (8g per batch). Each version was whipped for at least 3 minutes. The final versions (1c and 2b) where put for 30 min in the refrigerator, then taken out and whipped again. As there were no observable changes after the cold whipping, we do not treat them as a different version. We also made a small portion of dairy ganache for comparison purposes. Results. These are listed in Table 1. 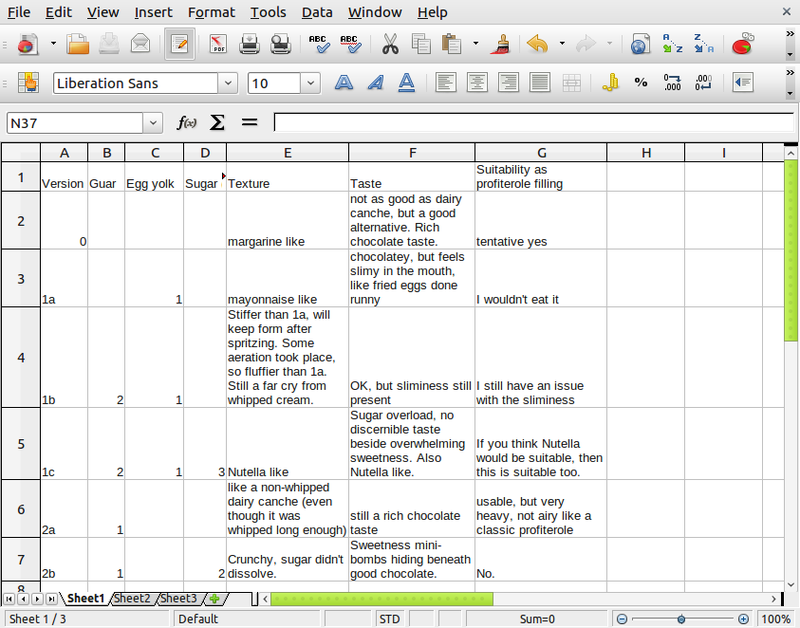 The numbers in the ingredients columns of the table represent the order of adding the ingredients to the mixtures. Table 1. Experiment results. The final consistency of version 1c is documented in Figure 1. Note that the peaks do not drip and you can rotate the bowl at 180° without anything falling out. The piece of chocolate was added for color comparison. Figure 2 shows a zoom of the blue bordered area in Figure 1. Discussion. It is possible to make a profiterole filling with coconut milk based ganache, but it isn't quite like the real deal. 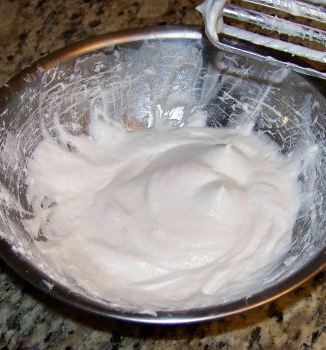 Also, it resembles non-whipped ganache more closely than whipped ganache. 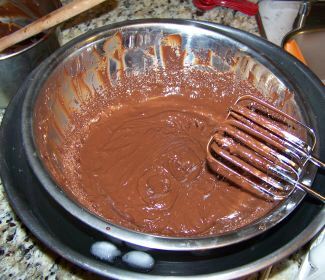 The basic ganache recipe can be done with coconut milk instead of cream and cocoa butter instead of butter. However, it tastes fattier than real ganache, and it is runnier. 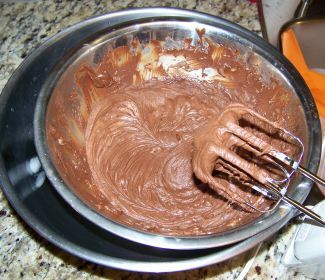 Unlike dairy ganache, whipping does not result in aeration. We think that eliminating the cocoa butter altogether will somewhat alleviate the fatiness problem, but we did not test this proposal yet. 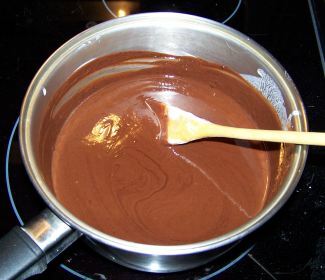 A thickening and or emulsifying agent can improve the ganache texture. Even though egg yolk improves aeration, is not a good choice, as it results in a slimy feel. Guar is a better solution. The addition of sugar ruins the chocolateness of the taste. 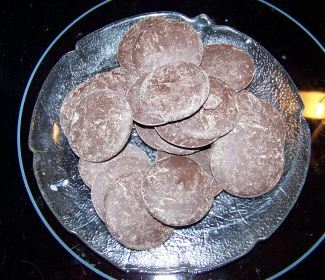 If bitterness is not desired, a sweeter chocolate (50%) should be used. Only dedicated sugar lovers or Americans should resort to adding sugar. In that case, it should be added before the guar (we would suggest dissolving it in the coconut milk before boiling it) as not to interfere with the texture of the final product. Threats to validity. First, there was a single tester (the quasi-royal we). Second, this tester is already biased in favor of dairy products in general and specifically for dairy based ganache. Third, many interesting combinations (including xanthan gum and corn starch) could not be tested due to lack of resources. Conclusion and outlook. We found the experiment very inspirating. It was also yummy. But we'd like to issue an warning: This experiment is dangerous. In the preparation phase, we discovered a penchant for guared coconut water deep fried in coconut fat we'd rather not have known about. Nevertheless, we are looking forward to offering the results for peer preview to a chocolate-loving lactose intolerant co worker. Inspired by rumtscho's incredibly detailed answer, which provided some informative although not quite "marketable" results, I set off on my own set of experiments. They are not quite finished, but I'll update this answer as more gets uncovered. First of all, I decided to start my experiments with coconut cream by itself because, why waste perfectly good chocolate on something that I'm probably going to end up throwing out? Left to right: Coconut cream, coconut milk, egg white powder, guar gum, xanthan gum, lecithin (liquid), and agar powder. 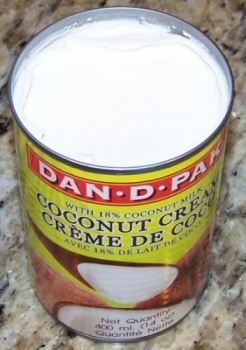 I've only used coconut cream a couple of times before, mainly for curries, and didn't even really remember what it was. 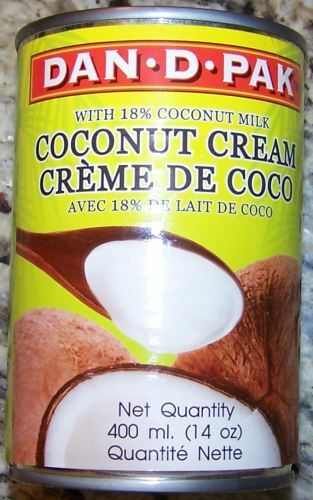 Judging by the other answers here, many people aren't actually familiar with coconut cream as opposed to the much more commonly-available coconut milk; to get coconut cream, you usually have to go to an Asian market (fortunately, there's a T&T near me). 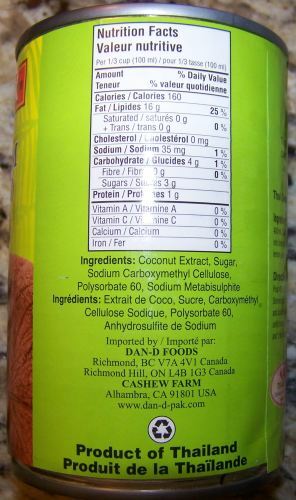 As you can see, coconut cream has a fairly high amount of fat, a surprisingly low amount of sugar, and almost no protein. Whilst thinking about what emulsifiers would be useful here, I noticed that the manufacturer had already beaten me to the punch; carboxymethyl cellulose and polysorbate 60 are well-known E number additives. I'm wondering if these are going to help me with whipping or just cause more problems. Note to self: Next time you make a curry with this ooze, mix it first. I gave it several minutes with an electric beater and it didn't even really start to whip. No peaks, not even really any bubbles. Based on the results so far, I decide not to bother with guar gum; this cream-like substance does need need thickening, it needs air. After the first 1/8 tsp, it's starting to thicken, but no real stability yet. 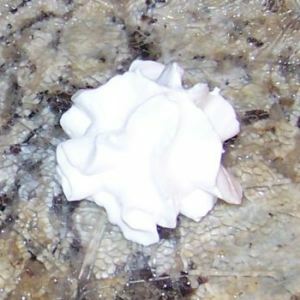 Another 1/8 tsp and soft peaks are starting to form. After the third round, it's starting to look very custard-like, and at 1/2 tsp of xanthan gum, it's really quite "gummy" indeed, resembling the consistency of melted marshmallow or marshmallow spread. Interesting, but not what I wanted. The optimal amount seemed to be around 1/4 tsp (per half-can or 200 mL) when I was seeing soft peaks; after that, everything really just went south. Verdict: Useful additive, but not sufficient by itself. I've also ruled out agar at this point, because that's just going to give me something even stiffer and more jelly-like than xanthan gum. 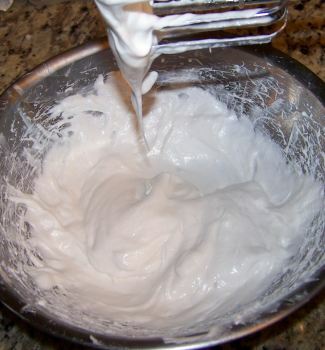 Even though real whipping cream is basically all fat and no protein, at this point I was considering that the coconut cream was simply too heavy and that the protein from egg white powder - basically meringue powder without the sugar - might help lighten it up a bit. 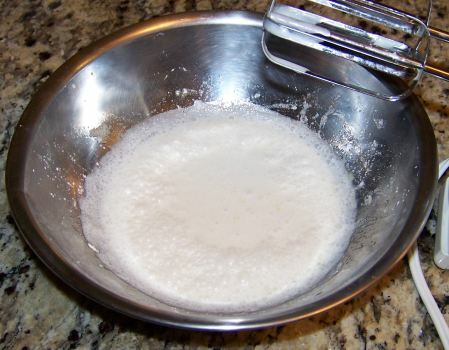 Intrigued by this, I decided to actually follow the instructions and get the egg white powder fully dissolved in water to make it... well, sort of like an actual egg white. I really seemed to get very little out of the lecithin except for a yellower hue. The last photo you see up there was after I (gradually) loaded up on xanthan again to see if it would make any difference at all over the first set of xanthan experiments - it really didn't, and the custard was pretty vile-tasting at this point. Verdict: Neither egg white powder nor soy lecithin are any help at all. At this point I was on my last batch of coconut cream and rapidly running out of ideas. If I'd had some carrageenan, I might have tried it at this point, but it's a very difficult additive to find around here. It was still holding together. 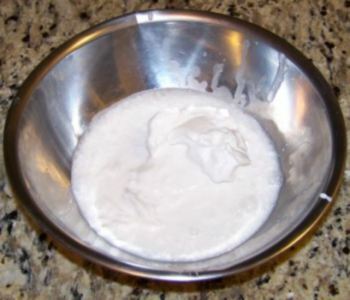 But don't be fooled by the appearance; xanthan gum is shear-thinning, so although this didn't collapse right away, it could easily be liquefied by enough jostling. 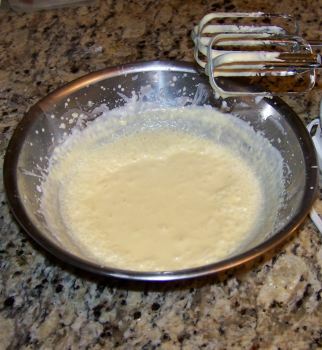 After another 2 hours at room temperature it was back to being a pancake (no picture yet). Some cocoa butter might make this more stable, but it's pretty pathetic compared to the chantilly cream, which has been sitting in my fridge for almost a week and is still stable. Verdict: The whipped cream charger was the missing link; along with some xanthan gum, it's enough to get this goo whipped. The trick will be getting it stay whipped, and I think I'm going to need something stiffer than xanthan - possibly carrageenan. I'm going to try gelatin; even though I can't really use that in the final product, it does function as a rough approximation of what carrageenan will do. It's also possible that some sugar (or icing sugar) might help stabilize this a little more, but I don't want to add too much, because the coconut cream is already slightly on the sweet side. Hopefully a combination of gelatin and xanthan gum will make this whip and "set", at which point I can try adding some cocoa butter (or whipping that separately) and folding it all into some melted chocolate for ganache. If the gelatin works at all then I'll order some carrageenan online because I know it'll hold up better than the gelatin due to its higher melting point. My experiments from last session, while promising, were strongly suggesting to me that coconut cream is just too heavy, too thick for this. It's full of thickening agents and emulsifiers already, so I had to wonder if I was swimming against the current trying to get just the right mix. The same mixture after trying to pipe it out of a bag. Most sources I found seemed to suggest using guar:xanthan in a 2:1 or 4:1 ratio, so I choose the latter. Using the "recommended" amount (#2 above) it starts to thicken but doesn't really form peaks - like adding corn starch. Doubling that, it starts to become a little too thick, but still sort of creamy, and not too gummy, so I give it a go anyway. 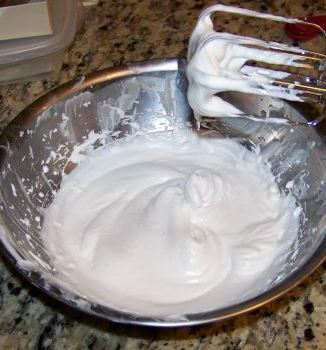 I also try adding a packet of whipped cream stabilizer (basically dextrose and a small amount of other additives), wondering if it might help. It actually sort of does - the peaks were a bit firmer - but it still doesn't hold up too well (what you see in image #5 is with the stabilizer). Verdict: This was a total failure but for one thing - it demonstrated conclusively that I did not need the heavily adulterated "coconut cream" in order to get a creamy texture. 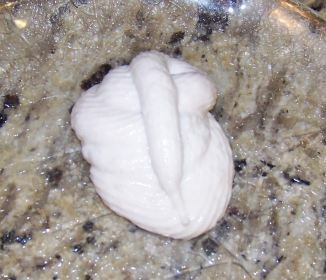 I could use pure coconut milk (coconut extract + water), add my own thickeners/emulsifiers, and get a result that was every bit as thick as the cream. Despite all of these failures, at this point I'm actually pretty sure I understand all the variables. I decide to go big or go home. Without thickening, it's pretty watery, so instead of using a ganache technique, I will use Hervé This's Chocolate Chantilly (see bottom of linked page) technique, as also mentioned in an earlier answer here. I don't want watered down chocolate, though; I want rich, thick, melt-in-your-mouth ganache! Having made several espumas in the past, I know that an appropriate amount of gelatin will set the coconut milk by itself to a mousse-like consistency. So I make an educated guess and assume that to be the total amount of gelatin I'll need for the entire ganache, since the chocolate should have plenty of lecithin already to help hold it together. Finally, knowing that xanthan is a better stabilizer than gelatin (despite being a poor gelling agent), I resolve to use a very small amount. I bloom exactly 3.6 g of powdered Knox gelatin in a new 400 mL can of coconut milk. (I didn't do any math here, it was just what I had left of an open packet). N.B. 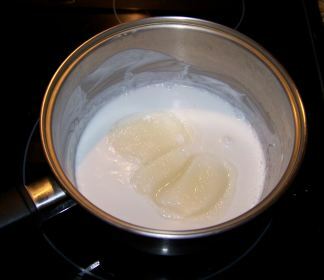 The coconut milk separates in the can, and needs to be blended before blooming the gelatin. After blooming for about 5-10 minutes, I set the mixture on the stove at medium heat, stirring until the gelatin dissolves. N.B. Coconut milk sputters a lot on the stove and seems prone to scorching - I had to lower the heat to medium-low. I break out the dark Belgian chocolate callets. Nothing fancy, just the generic wafers from the bulk food store, but a little better than the Baker's chocolate in supermarkets. In total I used approximately 14 oz. 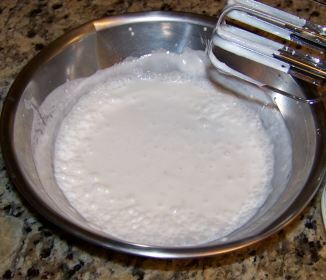 I add a little less than 1/8 tsp xanthan gum to the coconut milk/gelatin mixture, stir it up a bit, then toss in all the callets at once and let them melt (stirring constantly). N.B. The coconut milk was not that hot, so it had to be returned to the stove a few times to get everything melted. I set the mixture in a bowl, which is inside an ice-water bath, and start beating it constantly with the handheld beater (medium setting, although I don't think this matters much). The first image shows what it looks like while it's still hot. The last image above shows what it looks like cooled down a bit (but still warm) and, again, after constant beating. This is no trickery, I assure you - no camera gimmicks nor did I freeze it or do anything else to the mixture between between the last two photos. Completely dairy-free, using only coconut milk, gelatin, and a little bit of xanthan gum. This actually might be a little too stiff. It was hard (but not impossible) to pipe out. Next time, I'll probably lower the amount of gelatin slightly by 10-20%, and take it out of the ice water bath before it actually gets cool. At room temperature, this has roughly the consistency of soft cake frosting - exactly what you'd expect from a ganache. In terms of taste, I would have to describe this as: Oh god, somebody make me stop eating this before my stomach explodes. No lie - it's that good. It has an almost fudge-like quality to it, although I can't explain where that would be coming from. 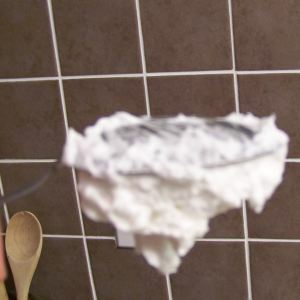 I recommend having a silicone spatula and piping bag, otherwise you're going to have a hard time cleaning it up; although you don't notice this at all in the mouth, in the bowl/bag it's a little stickier/pastier than its dairy counterpart. My version still turned out to be a bit hard to pipe at room temperature. However, the mixture softens and melts quite readily with heat, so if you've scooped it into the piping bag and can't push it out, try running some hot water over the bag itself; it worked perfectly for me. I'd like to test this with carrageenan in order to be sure that this can also be done totally vegan (or pareve). I still don't have any carrageenan yet. It will no doubt be missing some of the melt-in-your-mouth quality that the gelatin provides, but aside from the melting point, the two are pretty similar in the way they behave, so I'm confident that it won't be a problem. By the way: An hour and a half after I finished whipping this up, that plate I took a picture of, with the spiral of ganache - it's in front of me now and still standing up. This is 100% stable at room temperature. Now to finish licking off the beaters. I finally got around to trying this with carrageenan last week. I used a 0.75% solution of iota (would not recommended kappa for this, it sets too hard). The results were similar to gelatin, although not quite the same. It did ultimately work as a stabilizer, but due to the shear-thinning property, it was a little difficult to pipe out. Often what would happen was that it would start to set inside the bag, and I'd have to apply heat and/or pressure to get the first little bit out, and immediately after that the entire mixture would liquefy and I'd have to sit around waiting for it to harden again. Bottom line is that carrageenan is functional, but a bit of a pain to work with in this scenario, so if you can use gelatin, it's better to stick to that. Bloom 0.7 - 1.0% powdered gelatin in cold stirred coconut milk (I used 0.9%). 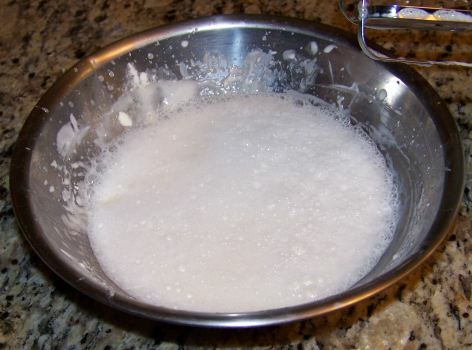 Heat coconut milk to dissolve. 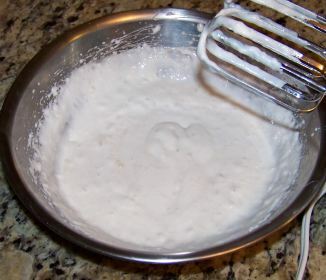 Stir in 0.1% xanthan gum (0.4 g or 1/8 tsp for every 400 mL). Take off heat and stir in dark or bittersweet chocolate (approx. 1:1, or 14 oz for a 400 mL can of coconut milk) to melt. Set a stainless steel bowl into an ice water bath and pour in the hot mixture. Beat with an electric beater (or aerating blade of an immersion blender) until cool. 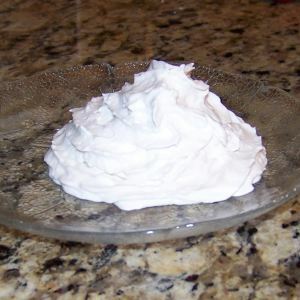 I was inspired to follow an Herve This recipe for Chocolate Chantilly using coconut milk. Here is a piccy of the end result. It looks and tastes how I imagine a whipped ganache would. 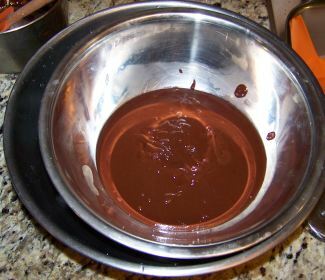 Break up the chocolate and melt in a small saucepan together with the coconut milk over a medium heat whilst whisking. 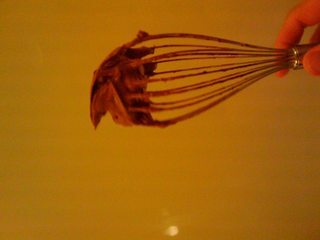 As soon as the chocolate is melted, put the sauce pan in the iced water and whisk until the mixture starts to thicken. Add the coconut butter and whip some more. I'm a little unsure on terminology. 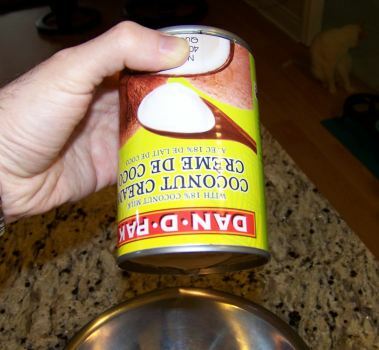 I assume the thick white part at the top of a tin of coconut milk is the butter (the stuff in the next picture). Update: In Australia the stuff I called coconut butter is sold in supermarkets under the name coconut cream. Reading Aaronut's comments, it could be that it has other names; coconut oil appears to be a possibility but I can't verify this. 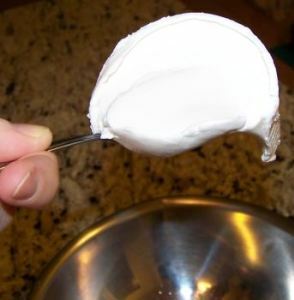 To whip coconut cream you need to take a can of Cream of Coconut and let it sit in the fridge up to 48 hours. The longer the better. Once you take it out, be careful not to shake it, turn it upside down or fiddle with it. All you need to do is open the can at the top. Scoop out only the cream and leave any liquid, the coconut water, at the bottom. 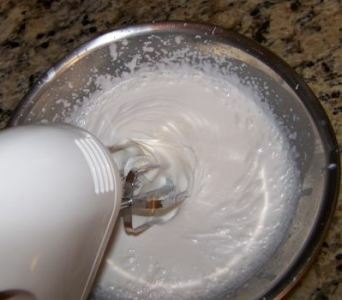 If you use any of that it will not stay firm once whipped, and probably won't whip really at all. 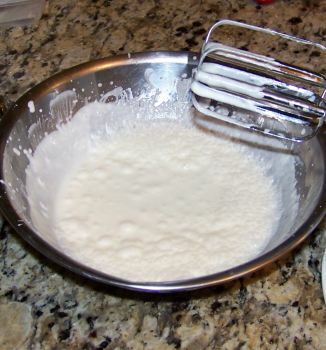 You need a cold bowl and wire whisk. I have not tried stabilizers yet. The only reason I know of this is because my daughter is allergic to milk and after the first time making it, my husband was hooked (coconut is his favorite food). Now, if you buy the cream of coconut with stabilizers in it, it won't work because you will not get the separation of the fat from the liquid, which is essential. 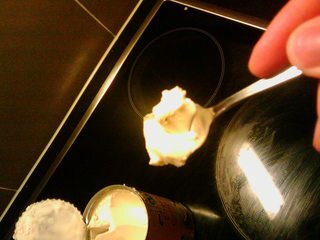 I am just trying to find out if I can freeze this kind of whipped cream for an ice cream cake. Not really ice cream though. I did read somewhere that if you need to add anything to fold it in after, and it would also need to be cold or the cream will deflate. Not the answer you're looking for? Browse other questions tagged substitutions chocolate pastry dairy-free ganache or ask your own question. 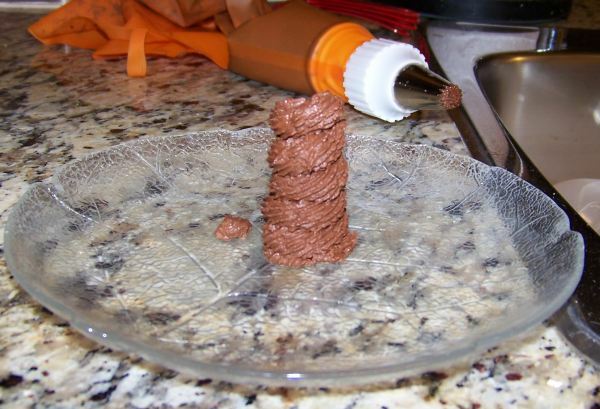 Can i freeze chocolate cream frosting / ganache? Can I substitute almond milk for heavy cream in chocolate glaze? 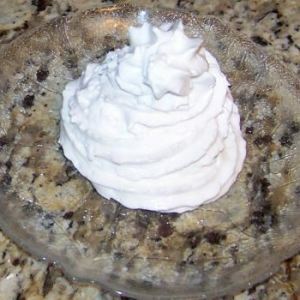 Is there a frosting similar to whipped cream but without cream?